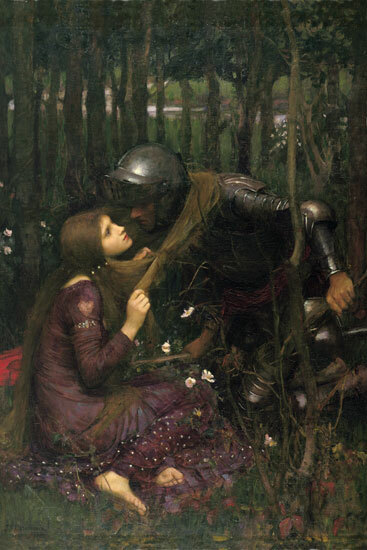 La Belle Dame Sans Merci O what can ail thee, knight-at-arms! So haggard and so woe-begone? The squirrel’s granary is full, And the harvest’s done. III. I see a lily on thy brow With anguish moist and fever dew, And on thy cheeks a fading rose Fast withereth too. IV. I met a lady in the meads, Full beautiful—a faery’s child, Her hair was long, her foot was light, And her eyes were wild. V. I made a garland for her head, And bracelets too, and fragrant zone; She look’d at me as she did love, And made sweet moan. VI. I set her on my pacing steed, And nothing else saw all day long, For sidelong would she bend, and sing A faery’s song. VIII. She took me to her elfin grot, And there she wept, and sigh’d fill sore, And there I shut her wild wild eyes With kisses four. IX. And there she lulled me asleep, And there I dream’d—Ah! woe betide! The latest dream I ever dream’d On the cold hill’s side. XI. I saw their starved lips in the gloam, With horrid warning gaped wide, And I awoke and found me here, On the cold hill’s side. XII. And this is why I sojourn here, Alone and palely loitering, Though the sedge is wither’d from the lake, And no birds sing.